Despite the anti-sentiment surrounding an American style Halloween and the fact that Halloween is relatively new to France, small pockets of French people do in fact celebrate this imported holiday if you know where to look. 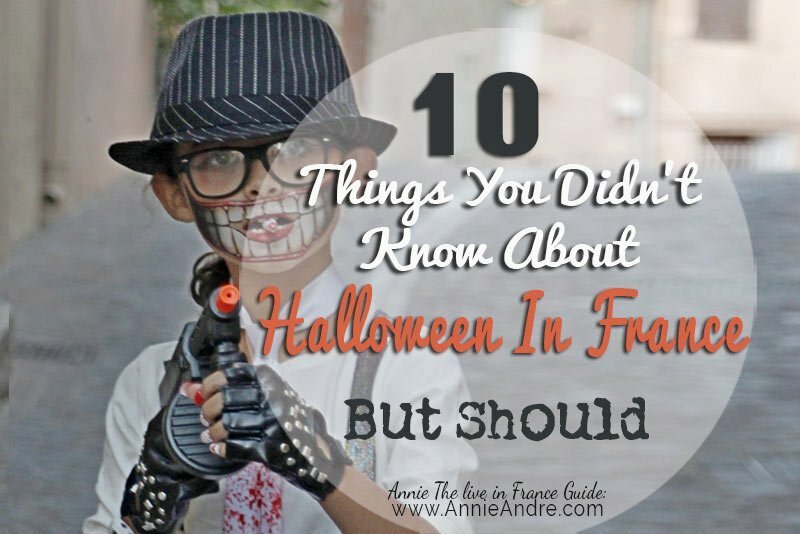 Here are a few things you need to know about Halloween in France. Although Halloween originates from Europe- and believed to be of Celtic origins, Halloween is seen as yet another imposition of American culture on French customs and traditions right after McDonald’s and Ketchup. This alone is enough to make many French people turn their patriotic nose up at the idea of celebrating and embracing Halloween. 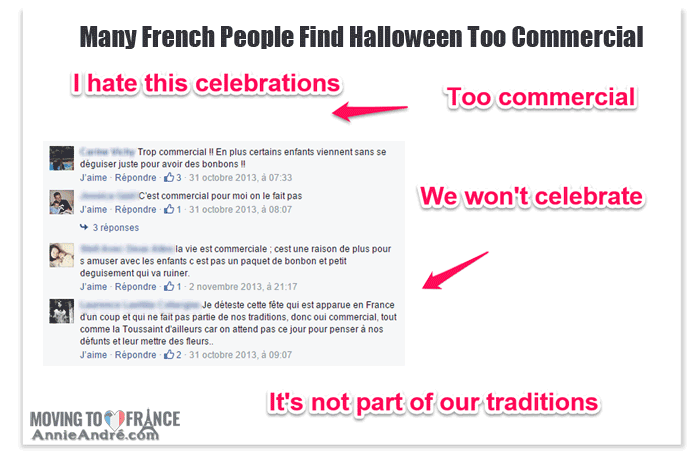 You might also be interested in this Why The French Hate Halloween and How To Celebrate It Anyways! Kids rarely come knocking on our door for candy on Halloween. In all the years we’ve lived in France, we’ve never had more than one maybe two groups of children come knocking. Some years, we get no none. I’ve heard that there are towns in France where Halloween and trick-or-treating has taken off but these are the exception and not the rule, so don’t load up on bags of candy unless you want to eat most of the candy yourself. Many French people complain that businesses and retailers in France use Halloween as a way to boost their sales and attract more customers. For example, food store chains will have an area loaded up with Halloween themed candies. Flower stores will put up Halloween displays. Bars and pubs decorate for Halloween hoping to pull in more customers. Sure this type of commercialism exists in countries like the US and Canada, but the difference is, Halloween is also a community and family-based event. At least that’s how it was for us when we lived in California. Since the majority of kids DO NOT trick or treat in France, the average French person only sees the commercialism part of Halloween. Maybe if more kids started trick-or-treating in France, more French people would see just Halloween as a family and community-based event as well. The French are fiercely proud about their customs, almost to a snobbish fault. Any celebration which disrupts or takes away from those traditions is often seen as a threat, not a treat. Since Halloween is not a traditional French holidays having first been introduced to France in the 90s, it has the unfortunate luck to occur right in the middle of an extremely big national holiday. “La Toussaint,” known in English as “All Saints” which falls on Novembre 1st. On this day people in France honour the dead by placing flowers on graves of loved ones and go to special church events. Banks, stores and businesses are all closed on this day. School get two weeks vacation leading up to this day. 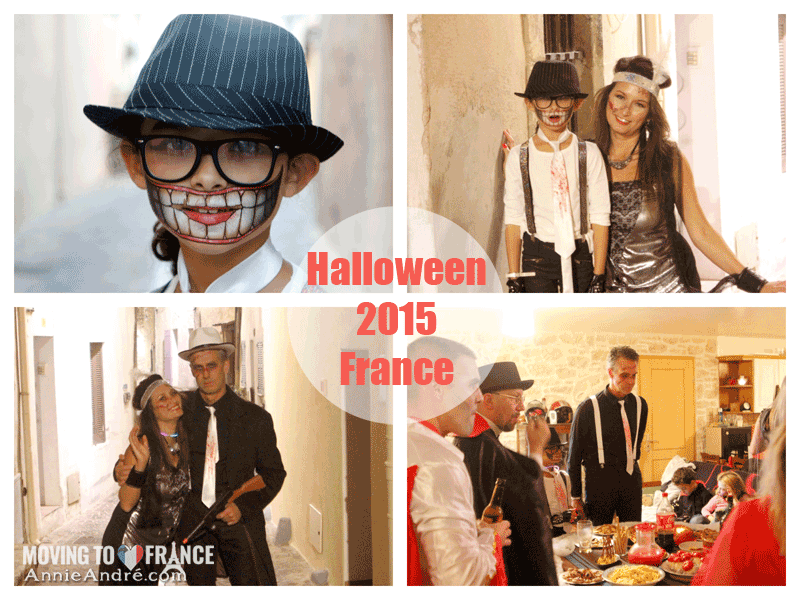 In the case of Halloween, many French people believe Halloween robs the attention away from this French tradition. Unlike in North America where anything goes when it comes to costumes for Halloween, what few adults and kids you see dressed up in France will invariably be dressed up in traditionally scary and ghoulish costumes like vampires, ghosts and skeletons. Costumes of the less scary genre like kitty’s, princesses and ninja turtles are reserved for the carnival festivals in February. What’s odd about Carnival in France is that the French don’t attach this same negative sentiment towards Carnival as they do towards Halloween despite its similarities with Halloween. Most schools even have their own mini parade where everyone gets dressed up. Yet Carnival is openly embraced in French culture and Halloween is not. 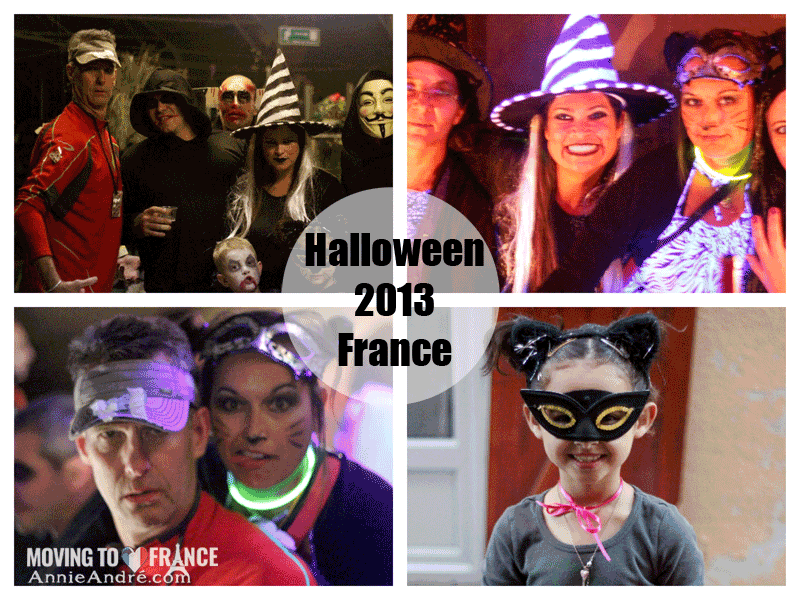 Blake and I were lucky enough to make some fantastic friends in France who invited us to their Halloween parties. It’s not commonplace, but it does happen. At the parties, we attended we were the only non-French people. I was surprised to see that there were very few kids at the parties we attended. When a kid comes to the door asking for candy “les bon bons” in France, they don’t say trick or treat. Instead, they ask you in French if you would like “Candies or a spell” or “Mischief or sweets”. Similar to How English speakers struggle to make the R and the U sound in the French word “RUE”— It’s not pronounced “WROO”, there are a few sounds French people have a hard time pronouncing too. If you hate candy corn as I hate it then you’ll be happy to learn that candy corn does NOT exist in France. 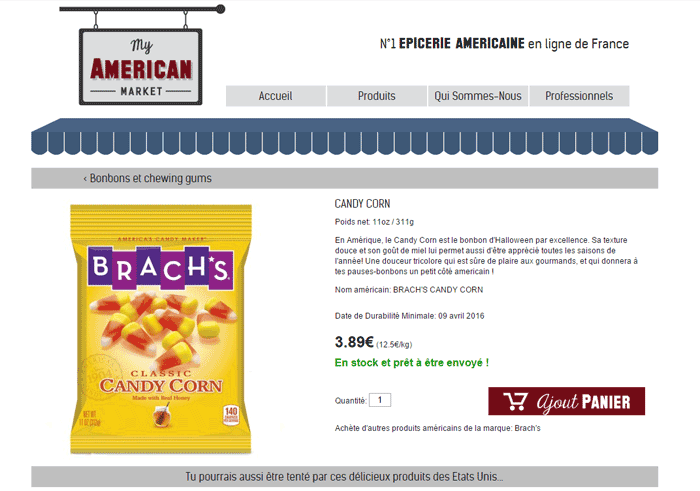 If you really must buy some, you’ll have to order it online at the “American Market” in France. Despite all the anti-sentiment around Halloween in France, you can still celebrate it. 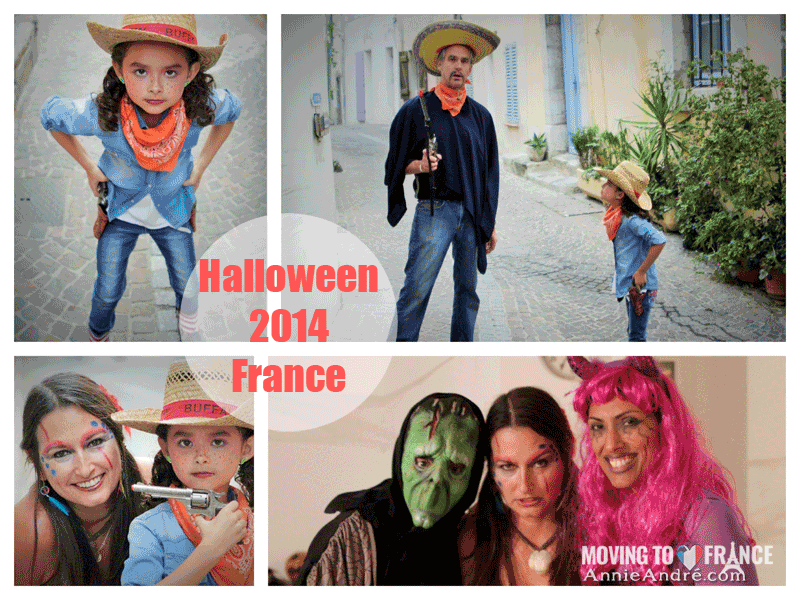 We’ve lucked out and had some great fun on Halloween in France thanks to friends who love celebrating, but if you don’t have friends yet or don’t know anyone who celebrates Halloween, you can wing it as we used to when we first arrived in France and just take your kids’ door to door trick or treating. Just don’t expect many people to have candy on hand when they answer the door. You could also throw your own Halloween party or take the kids to local businesses and retail shops who usually hand out candy to kids on Halloween. That’s what we do in Montpellier. Or you could just do nothing.